One of the most enduring myths of California water politics is that the Delta Tunnels promoted by the Jerry Brown and Donald Trump administrations are designed to divert Northern California water to “fill swimming pools” and “water lawns” in Southern California. In reality, 80 percent of northern California water exported south of the Delta goes to irrigate agribusiness operations in the Central Valley, while the rest goes to urban and industrial users, including those in Southern California who have made many successful efforts to reduce water use and recycle water. The controversy over the Delta Tunnels, also known as the California WaterFix, is not one between Northern California and Southern California. It is fact a battle between the people of the California, including Southern California water ratepayers who oppose the project for an array of reasons, and the corporate agribusiness interests, rich water barons and brokers, and the Trump and Brown administrations, who are pushing for the construction of the two giant 35-mile long water tunnels under the Sacramento-San Joaquin River Delta. Countering the false “Northern versus Southern California” narrative, a coalition of environmental justice and social justice groups from throughout the Los Angeles area on July 29 exposed how rising water rates have resulted in alarming number of shutoffs to low income water users — and how the Delta Tunnels will only make things worse by raising water water rates. Food & Water Watch, Union de Vecinos, the Alliance of Californians for Community Empowerment, POWER, the Environmental Justice Coalition for Water and other community groups released information showing that 20,000 Los Angeles County households experienced water shutoffs over the last two years in the cities of Los Angeles, Long Beach, and South Gate. “The Los Angeles Department of Water and Power shut off service to 9,105 households in 2015 and 2016,” according to a statement from the groups. “In the same period, Long Beach shut off water to 5,284 households and the town of South Gate, a predominantly a low-income, Latino community, shut off 5,850 households. Together the three cities cut water service to more than 20,000 households, affecting an estimated 65,000 people”. The groups said these water agencies could soon subject their customers to additional rate hikes to pay for Governor Brown’s Delta Tunnels, a multi-billion dollar project that would force higher water rates throughout Southern California. Research by EcoNorthwest reveals that the average LADWP customer would see their water bills rise up to $393 annually. San Joaquin Valley Central Valley agribusiness interests, including The Wonderful Company owned by Beverly Hills billionaires Stewart and Lynda Resnick, would primarily benefit, while Southern Californians would get no additional water. 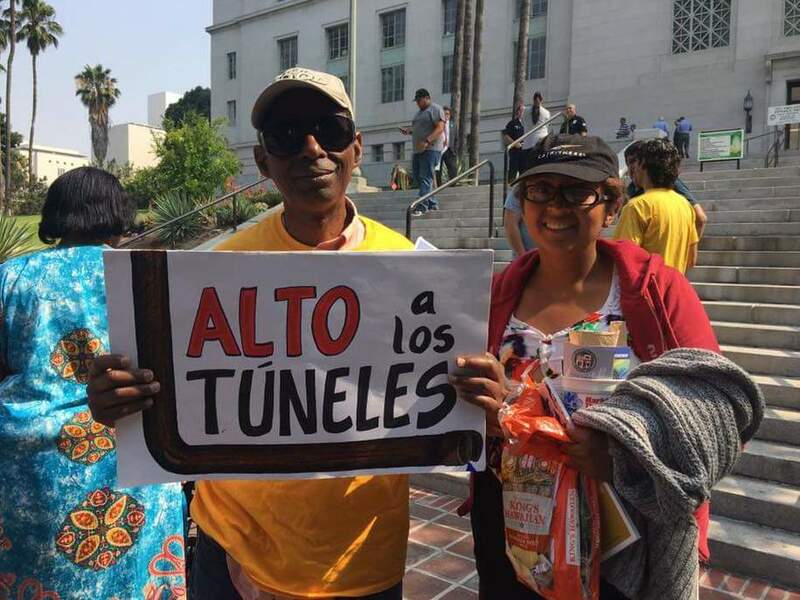 “Low income families are struggling to survive in Los Angeles and cannot afford to be subjected to additional rate increases to subsidize billionaire corporate farmers,” said Leo Vilchis of Union de Vecinos. She said labor advocates worry that the city could “squander the opportunity” to create good, local jobs creating rainwater capture systems and other local water projects. SEIU Local 721, the union that represents Southern California public service workers, recently voiced its opposition to the Delta Tunnels in a letter to the Board of Directors of the Metropolitan Water District (MWD) of Southern California. The union’s 97,000 members deliver public services in counties, cities, sanitation and water districts and non-profits across six counties including Los Angeles. Norton said more and more families throughout the country are struggling to pay their water bills, noting that a recent Michigan State University study found that over the next five years, more than a third of households nationwide could be unable to afford this essential service. “Because fewer federal dollars are available to support municipal water systems, household bills are growing to pay for improvements and repairs. Water rights advocates have raised concerns that municipal water services will be privatized under the Trump administration’s coming infrastructure plan, exacerbating the growing water affordability dilemmas nationwide,” she explained. Norton, Vilchis and other water rights advocates called on Mayors Garcetti and Garcia and city council members in the region to take a strong stand against local water shut offs and oppose the California WaterFix. “While the state estimates that construction costs will be about $16 billion, the final cost of project including financing could reach $67 billion. Even in the best-case scenario, a University of the Pacific professor, Dr. Jeffrey Michael, has found that the project will provide only 39 cents of benefit for every dollar of cost,” Grant wrote. The 38 members of MWD’s Board of Directors are scheduled to vote on the WaterFix this September, according to Grant.These members represent 26 different local governments and water agencies, including the city of Los Angeles, the city of Long Beach and the Central Basin Municipal Water District, which provides water to South Gate. As I predicted on election night, the Trump and Brown administrations have apparently made a deal to fast-track Brown’s legacy project, the Delta Tunnels. The Brown administration praised the deeply flawed biological opinion, a document that may have been politically manipulated, in spite the vow Jerry Brown made in January to “resist” Trump administration attacks on science. However, Michelle Banonis, Assistant Chief Deputy Director at the California Department of Water Resources, was hardly ready “ready to fight” when she spoke at a joint teleconference, a virtual lovefest between the two administrations to promote the decision. Banonis gushed, “On behalf of the California Department of Water Resources, I would like to thank the US FWS (US Fish and Wildlife Service) and the NMFS (National Marine Fisheries Service) for their significant efforts in putting together the biological opinion for California Water Fix. We feel this is a momentous step towards the future and we feel that this will help in the future in balancing between water and environmental resources in California." No Comment to " LA ratepayers protest water shutoffs; more rate hikes expected with Delta Tunnels "